Last month, I was invited to the The Academy of Makeup Scotland to attend a gory special effects makeup masterclass with TV & Film makeup artist Sophie Edwards. I just had to share her ‘Chelsea Smile’ tutorial with you as the final look is amazing. First, you need to contour underneath the cheekbones with a matte grey eyeshadow, down to the corner of the mouth. Then add some red eyeshadow to your contour, to make the area look sorer and more bruised. 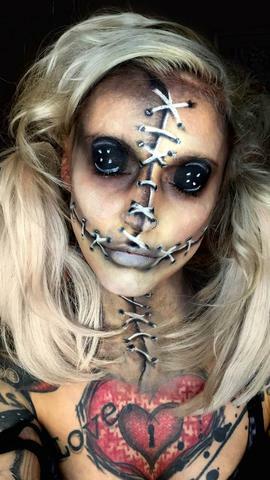 Sophie used Inglot Cosmetics eyeshadows to do this. Now it’s time to start adding some of the 3D fleshy details. Gelafix by Kryolan comes as a solid in a plastic packet that you need to melt in a cup of hot water, and you use it to replicate skin. Once you apply this product to the face, you need to work quickly and you can’t move it around too much. and some texture to get the effect of torn skin. Set with a translucent powder to take any shine away. Use spirit gum underneath the Gelafix if you want it to last all night, as Gelafix is quite easy to peel off. Now it’s time to add the blood. 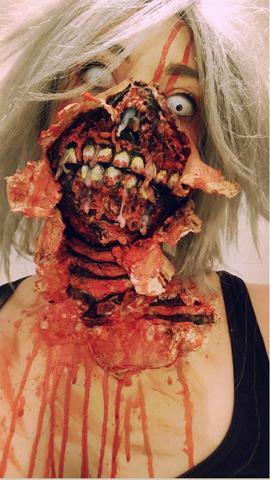 Sophie started with a product called Raw Flesh SFX, which is a gel blood product. Use this to make it look like the wound is filled with bloodied flesh, by applying it down the centre of the gash, and also around the gash to look like flesh is hanging off. want. Then, add some more black greasepaint to keep the depth of the gash there. where it flow where it wants to for a natural look. Sophie use the Dark Blood from Pigs Might Fly – a brand created by special effects makeup artist Nick Dougman. It has a very runny texture. Finally, pat some of this blood onto the lips, to make the whole look appear more natural. If you try this and find you are quite the dab hand, you can enter the school’s Halloween makeup competition. There are two categories – Blood & Gore and Fantasy & Character. The prizes are great and you can enter until 31st October 2016. The images above are last years winners (Karen Harding and Carol Paterson), so this is the standard you have to compete with.